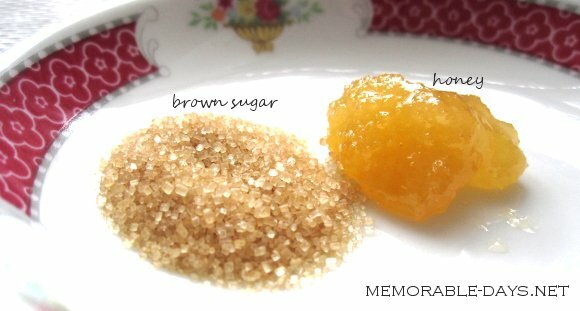 DIY Lip Scrub With Honey & Sugar | Memorable Days : Beauty Blog - Korean Beauty, European, American Product Reviews. During the cold days you will easily get dry lips and get flakes >.<" EEK...! Putting heaps of vaseline on it won't remove the flakes. However, don't waste your money on lip scrub products. You can easily make one at home within 1-2 minutes. All you need is an empty bowl/plate, a spoon, a small empty container, honey and brown or white sugar. Most of the people will have this at home. Check the consistency, if you want it more abrasive add more sugar. If you want it less abrasive add some more honey ;). 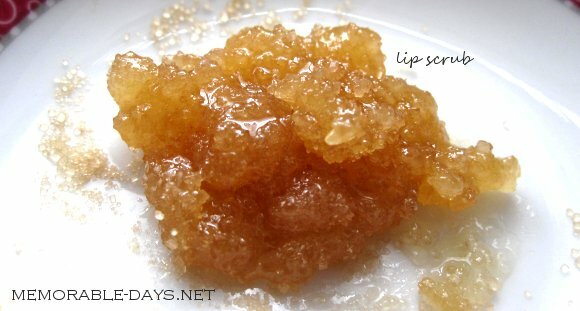 And voila~ here is your lip scrub. Put a bit of lip scrub on your fingers and scrub it on your lips for a few seconds (you can also use a toothbrush instead of your fingers). When you're done remove it with a wet towel and put some lip balm on your lips to moisturize it again. Your lips will feel smooth, soft and flakes free. It's really a cheap and effective lip scrub ^__^. With that amount you can use the scrub for like 2-3 times. You can leave the rest of the lip scrub in an empty container and you can use it the next time again. Don't use this scrub when you have a wound around the lip area or if you have herpes labialis. @Michelle.. Hmm.. these are two natural products that you can normally eat, so i actually think that it won't really have negative effects on your lips =). thanks! i gota try this ! @Rinny, It's tropical honey which you have to scoop out of the jar xD i'm keeping the honey in the kitchen where it's a bit cold.. Because of the cold weather it became a bit gelatinous haha. @Sam, als scrub voor je gezicht is ook best lekker ja ^^ ! sounds like a sweeet and tasty treatment indeed! me suffering chap lips indeed applying so much lip balm and not working boooo! LOL cute, i can just imagine how yummy this would be on the lips! thanks for commenting and visiting my blog! enter my giveaway celebrating 100 followers!